The Lenape Tech Wellness Committee will meet on Monday April 8th, 2019 in the Administrative Conference Room. We invite members of the public, parents, and current students to join. If you wish to attend, please contact Mrs. Diana Heuser at 724-763-5910. Join us for our 2019 Spring Open House! Guests are welcome to visit some of our 14 technical programs and visit other events like our first ever Prom Fashion Show and Touch-A-Truck. Raffles and door prizes will also be given out! Good Morning, Due to Apollo-Ridge cancelling school today due to a power outage, Part-Time students from Apollo-Ridge may be picked up by a parent or guardian at Lenape Tech after 10:15 am. If students are unable to be picked up, students may stay at Lenape Tech all day, and will return home on the same Lenape Tech Bus they ride in the morning. Lenape Tech will be open on Monday January 21st as we are making up for a snow day! We would like to recognize our Honor Roll and Perfect Attendance recipients for Trimester 1! Lenape Tech will be closed November 22, 23, and 26th for Thanksgiving. Have a safe and wonderful holiday!!! On Oct. 15th and 16th, Lenape Staff will be welcoming 9th and 10th graders from our sending districts to tour our building. All parent/guardians are invited to come and meet your student's teachers this Thursday from 5-7 PM and Friday from 12:50 - 2:40. The staff looks forward to meeting with you this week! Due to multiple weather related road closures and detours, your child’s bus may be delayed this evening. Please check list below for available road closure and detour information. Lenape Tech will continue to run a mid-day shuttle for students attending West Shamokin until school starts. The shuttle will be stopping in Templeton Area, State Route 85 past Oscar Road, and Dayton Area. Elderton Area students will be dropped off at West Shamokin High School. Students will be riding B-152. Depending on usage, times will be adjusted. Lenape Staff will be assisting students on Tuesday with the shuttle. The Comprehensive Planning process at Lenape Technical School was purposefully designed to be collaborative and include all stakeholders. A planning committee was formed to assist in the development of Lenape Technical School’s Comprehensive Plan. Key staff members and representatives as outlined by the PA Department of Education did participate in the development of the plan to ensure that multiple perspectives were considered. The initial presentation of the Comprehensive Plan to the Joint Operating Committee occurred on June 21st, 2018. The period of public review and comment on the plan will continue until August 10, 2018. The plan will be presented to the Joint Operating Committee for approval on August 16th, 2018. The plan will be submitted to the Pennsylvania Department of Education by September 1, 2018 for review and approval. Please click on the link below to review the plan. Lenape Tech will be holding new-student orientation and welcome events to introduce incoming 10th and 11th grade students to the Lenape Family. This is an opportunity for all first-year students new to Lenape Tech as well as their parents or guardians to come in for a meet-and-greet with your technical instructor, school administrators, and Lenape staff and give you a chance to ask questions and learn more about your school. Lenape Tech's commencment ceremony will be held on May 25th, 2017 at 7:00PM in Lenape's gymnasium. This article contains all pertinent information about policies, procedures, and general information related to Lenape Tech’s commencement ceremony. Lenape will be closed for Spring Break beginning Thursday March 29th through Monday April 2nd. Classes will resume Tuesday April 3rd. On Wednesday (12/27/17) one of our students died tragically. A sudden loss like this can have a profound effect on students. It is important that we recognize this loss and offer help. Counselors will be available THURSDAY December 28th from 11 am to 2 pm at the school to speak with any students who would like to talk with someone. Counselors will also be available on January 2nd when school resumes. From all of us here at Lenape Tech, we wish you and yours a wonderful Holiday Season. The school year is moving along quickly with the students hard at work, the staff is grateful for our students continued pursuit of their education. Enjoy the Holiday Break and we look forward to seeing everyone back on Tuesday January 2nd! Lenape Technical School will be closed from December 23rd thru January 2nd. Our snow make-up day will be Monday January 15, 2018. Lenape Tech is Closed today, Thursday December 14th due to weather. The staff at Lenape Technical School wishes you all a happy and safe Thanksgiving Break. The school will be closed Thursday 11/23 - Monday 11/27. School will resume on Tuesday November 28th! Mark your calendars for Progress Report Pickup this week! We will be having two presentations that may be of interest to our parents and students. One is from the Builder's Guild and the other is for students planning on financial aid for post-secondary education. We hope to see you there! Thursday August 17th is our first student day. Sessions begin at 8:30 AM! See this page for tonight's Graduation live stream! The feed will become active a few minutes before 7:00 PM and the offical start of Graduation. Lenape Tech's commencment ceremony will be held on May 26th, 2017 at 7:00PM in Lenape's gymnasium. This article contains all pertinent information about policies, procedures, and general information related to Lenape Tech’s commencement ceremony. Please read the flyer concerning school vaccination requirements. Check with your son or daughter’s physician if you have questions about their vaccinations. There is also a toll-free number (1-877-PA-HEALTH) that you can call for more information. Students entering 12th grade must have all their vaccinations on the FIRST day of school unless they are exempted (see flyer for a list of the exemptions). Lenape Technical School is closed on Friday March 24th. March 21st is Lenape Technical School’s NOCTI Performance Day. All 10th graders are not to report to Lenape Technical School on March 21st. All 10th graders should contact their home school to arrange for morning transportation. All Part-Time Seniors and Co-Op Students are required to attend all day on March 21st. Students at the Lenape Technical School in grade 12 will be participating in the National Occupational Competency (NOCTI) Job Ready Assessment during March and April. Students will be tested in two areas. The written (given the week of April 24th) test covers factual knowledge, technical information and the understanding of principles and problem solving related to the students chosen technical program. The performance test (given on March 21st) allows the student to demonstrate that they have the skills required to do the job. The test will take place in the student’s shop where local business and industry persons will evaluate the student’s performance. The test are sent to the National Occupational Competency Testing Institute for scoring. The regular meetings of the Lenape Joint Operating Committee of the Armstrong County Area Vocational-Technical School Board are scheduled for the third Thursday of each month at 6:30 p.m. in room A127 of the NexTier Adult Ed Learning Center at Lenape Technical School, 104 Armstrong Street, Ford City, PA 16226. The Lenape Technical School does not discriminate on the basis of handicap in its services, programs, or activities. If you are in an individual with a disability and wish to attend the public meetings, and you would require auxiliary aid, service, or other accommodations to participate in the meeting, please contact Diana Heuser at 724-763-5910 to discuss how Lenape may best accommodate your needs. Please join us for Progress Report Pick Up on Thursday Jan. 12th from 5-7 pm and Friday Jan 13th from 12:50-2:45 pm. Teachers will be available to meet regarding your students grades and upcoming assignments. Progress Report Pick Up is next Thursday (9/29) from 5 – 7 PM and Friday (9/30) from 12:46-2:45 PM here at the school. This is a great time to not only get your student’s progress report, but to meet your student’s Teachers and other Lenape Staff Members! If your student is interested in attending a Post-Secondary Education Institution, please join us on Monday September 19th at 6 pm. This informative session will outline financial aid options as well as an overview of the process and application for financial aid. If you have any questions, please contact the Guidance Office at 724-763-7116 Ext. 3304. Congratulations to the Class of 2016! The staff and administration wish you all the best. For our returning and new students, school will begin on August 17th. Everyone, have a safe and enjoyable summer. If you need to contact anyone at Lenape, we will be here Mondays through Thursdays 7:00 to 3:30. Midmorning on Friday, May 13, 2016, officials at Lenape Tech in Manor Township, Armstrong County, PA, followed protocol upon learning of a potential building emergency. Students and staff evacuated the high school to the nearby Adult Learning Center from where they were dismissed from school for the day. Families were notified of the dismissal via the school’s broadcast system. The school safety team mobilized resources to verify safety and security of the buildings and campuses. Pennsylvania State Police responded immediately to the school securing the area. A search was conducted by officers and by a canine specializing in explosives with negative results. At no time was there a weapon or explosive recovered. The investigation is ongoing. For information about 2016-2017 enrollment, please go to the guidance page for information and application. Deadline for enrollment in April 15, 2016. For questions about enrollment, please call 724-763-7116 x3304. On Tuesday March 22nd, all Lenape seniors will be participating in the NOCTI performance assessment. On this day, 10th graders DO NOT report to Lenape. All juniors report as normal. All seniors (full and part-time students) need to report to Lenape by 7:25 am. Lenape will now be open on Tuesday March 29th. Current 9th and 10th grade Students and their Parents are invited to spend an evening at Lenape Tech to discuss educational opportunities and meet teachers in any of Lenape's 15 Technical Programs. To register, please contact Lorie at 724-763-7116 ext 3300 or email parslor@lenape.k12.pa.us. Three (3) technical programs you wish to learn more about. Registration is at 5:30 with the program running from 6:00-7:30 pm. Cap & Gowns, Graduation announcements & all other Balfour orders and money will be taken on February 3, 2016, during school at Lenape Tech. Order forms were distributed to all seniors the week of January 11th. Call Mr. Jones at (724) 763-7116 ext. 3308 to reserve your seat. It is hard to believe but we have just finished our first trimester. Report cards were mailed home last week. If you have any concerns about your student’s report card, please contact the guidance counselors, Mrs. Ligus or Mr. Jones. They will be happy to help anyway they can. On December 20, 2016 Lenape Technical is hosting the SMILES program, a mobile dental clinic, for our full and part time students. A letter about the program was sent with trimester 1 report cards. Below is a copy of that letter from our school nurse, Mrs. Schnaubelt. Check out some local job opportunities! 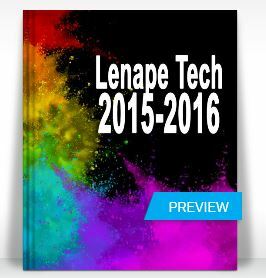 Welcome to the 2015 – 2016 school year at the Lenape Technical School and to our new website! I hope that you have enjoyed your summer and are feeling ready to start a new school year. How quickly summer ends though, and our thoughts begin to focus on the start of another great school year! As Lenape’s assistant director / principal, I am very excited to meet new students and families and to catch up with our returning students and families. As you can see, a lot of things have changed around here. We are excited about the new look and we hope you will find the new site easier to navigate and find what you are looking for. Please note that Lenape’s school day has changed. Monday - Thursday school is in session from 7:25 to 2:40. On Fridays, students are in session from 7:25 to 12:40. Lenape Tech will develop the foundation for students to succeed in an ever changing, technological world by providing an active learning environment which will lead to a prosperous and rewarding future for self, family, and community. Come out and see the many opportunities for future success that are available here at Lenape Tech. By meeting with faculty and school leaders while touring the school, see how EDUCATION AT WORK at Lenape works for students! This year, in addition to program tours, check out our 2 Additional Seminars highlighting excellent opportunties for students. Contact Mrs. Parsell to register at 724-763-7116. Click here for the registration form. Student Picture Day is this Thursday August 23th at Lenape Tech! Please click here for an attachment from Lifetouch on how you can order pictures ahead of time! Lenape Tech’s prom will be held at the 10th Street Station on Saturday, April 27, 2019. The prom will begin at 7:00 p.m. and conclude at 10:00 p.m. Below is all pertinent information about policies, procedures, and general information related to Lenape Tech’s prom. School will be closed Friday April 22nd and Monday April 25. These days were scheduled as snow make-up days. Students will now in session on February 20th, April 3rd and May 7th. The staff of Lenape Technical School has worked hard to get ready for the 2016-2017 School Year! The 1st Day of school for Lenape Technical School is Wednesday August 17th! This is a reminder that all students should be in their 1st period class by 7:25 AM. The school’s staff will be available to help students find their 1st period class. We look forward to seeing all students on August 17th! The regular April meeting of the Lenape Joint Operating Committee of the Armstrong County Area Vocational-Technical School Board, which was schedule for April 21st, is cancelled. The meeting has been rescheduled to Thursday, April 28th, at 6:30 p.m. in room A127 of the NexTier Adult Learning Center, 104 Armstrong Street, Ford City, PA. .
Lenape's Staff wishes our students competing and showcasing their talents on the field this fall a great season! For Brandon’s Efforts, Brandon earned over $5,000 dollars in scholarships to attend Lincoln Electric’s Comprehensive Welding Program! There will be a meeting of the Lenape Technical School JOC Budget Committee held for the purpose of planning/preparing the 2018-2019 operating budget. The meetings will take place prior to the regular meetings scheduled Thursday, February 15, 2018 and Thursday, March 15, 2018 @ 6:00 P.M. in room A127 of the NexTier Adult Ed Learning Center at Lenape Technical School, 104 Armstrong Street, Ford City, PA 16226, with the regular meetings immediately following. With the arrival of an early spring (thank-you Punxsutawney Phil), come thoughts of the school year ending. The next ten weeks will be flying by. Our seniors are defintely looking forward to graduation on May 27th. Between now and then they are going to be very busy with their NOCTI assessments, job skills demonstration speeches and finalizing their post Lenape plans. Many of our students already know what they are going to do and are heading off to post-secondary education (2 year and 4 year programs), union joint apprenticeship training programs, the workforce and the military.